Beautifully nestled between the Caribbean Sea and the Nichupté Lagoon in the less-crowded southern end of Cancún, Royal Solaris Cancún is within 2 km (1.25 mi) of the El Rey Mayan ruins and Ventura Park. Royal Solaris Cancun is a magnificent family all inclusive resort with 300 rooms well located, overlooking the Nichupte lagoon or the Caribbean Sea, in a complex that has a unique pyramidal structure. Enjoy all the entertainment with daily activities and nightly show for you. Children also have a special place for fun in the Mini Club and Mini Water Park, supervised by the staff. "Rodizio Dinner" ... Twice a week guests can enjoy a delicious option for dinner. The perfect gourmet place to enjoy an exquisite and unforgettable dinner. Find yourself magnificent menus during the week, not forgetting the fantasy desserts. Open from 6:00 p.m. to 10:00 p.m.
Open for lunch with traditional and very well set buffets, and dinner with extraordinary and wide Mexican cuisine à la carte. Open from 12:00 p.m. to 4:00 p.m. 6:00 p.m. - 10:00 p.m. Enjoy delicious homemade pizzas including vegetarian and classic flavors. Menu is available or creates your own pizza with our assorted toppings. Opens daily from 12 pm to 6 pm. Beautiful and well located restaurant by the hotel lobby area. During breakfast enjoy a wide variety of Fresh fruit, juices, regional dishes, Antojitos Mexicanos: "little Mexican whims", etc., the perfect place to prepare your favorite omelet. For dinner, you will enjoy the different delicious buffets: Italian, Oriental, the International Gala; with its traditional cheese menu, and the unique Mexican Buffet. 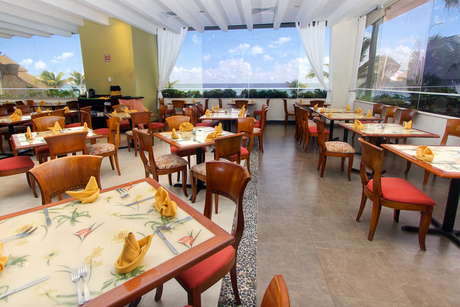 'Las Fuentes' offers dinner buffet style every night. From 6:30 to 11:00 am. From 11:00 to 11:30 am. From 7:00 to 10:00 am. From 6:00 to 10:00 pm. The snacks will tantalize your taste with delicious traditional "guacamole", hamburgers, Mexican "nachos", nuggets, hot dogs, chicken wings and more. Enjoy your favorite drink in the swimming pool. A place to enjoy delicious, fresh and well prepared regional and international cocktails. Ask for the COCO-MANGO, delicious, refreshing and so Royal Solaris. Open daily from 10:00 a.m. to 5:30 p.m. The perfect place to make new friends and enjoy live music from Monday to Saturday. Also, you will spend an unforgettable time with our entertainment staff and their enjoyable activities. Come & join to the party or listen to your favorite song. Open daily from 5:00 p.m. to 7 a.m. Snack and Drinks If you are coming back from nightlife and you are starving, do not worry, they still have more for you. After 1:30 a.m. snacks and beverages are served in the Lobby bar. Stop by for some late-night beverages and munchies all night until 7:00 A.M.
A new place where the youngest guests will enjoy many activities that stimulate their imagination and keep them happy and occupied. This new colorful playground area allows them to have fun while on vacations in Cancún. Opens daily from 9 to 5 pm. From 0 to 4 years old. Parents must be supervising their children at all times. *Room rates include unlimited food and drink at 5 restaurants and 3 bars, as well as use of facilities including a pool complex, a Kids' Club with mini water park, daily activities, and nightly entertainment. 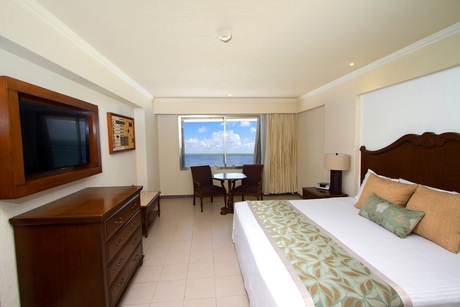 The Royal Solaris' air-conditioned rooms offer full ocean view or sunset- lagoon view. 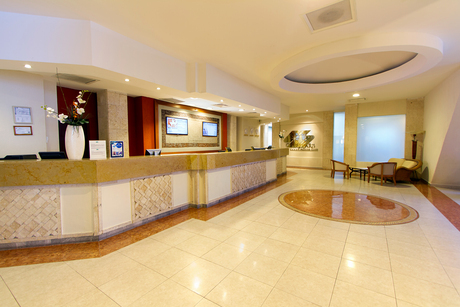 All rooms also have satellite TVs, wireless internet for an additional charge, in room safety boxes and clock radios with CD player. For the Restaurant Marco Polo reservations and dress code are required (shorts , beach sandals or swimsuit are not allowed). Children are welcome. Additional fees apply per child per night according to the age of the child. Please be aware children fees are due at check in and will have to be paid directly to the hotel. Guests must confirm children ages upon check-in in order to receive bracelets for all-inclusive meal plan for each child staying in the room. Please note that failure to do so will result in an automatic change to the daily rate and children will be charged as adults. No exclusions. 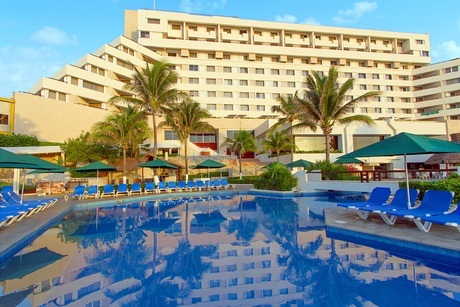 Royal Solaris Cancun All Inclusive Resort is an ideal Cancun lodging choice for your trip to Mexico. With numerous amenities for guests such as car rental, children's play area, beachfront, you will wake up at Royal Solaris Cancun All Inclusive Resort feeling invigorated every day for your time in Cancun. Don’t let this amazing reservation opportunity pass you by, book your stay at Royal Solaris Cancun All Inclusive Resort today to make the most of your time in Cancun, Mexico.